America sent thousands of Protestant missionaries abroad to Christianize and Americanize the world. Many returned, however, and globalized America. The Congregationalist leader Buell Gallagher dubbed this phenomenon the “missions boomerang,” and David A. Hollinger sets out to write its history in Protestants Abroad: How Missionaries Tried to Change the World but Changed America. Flung abroad to change the world, the boomerang returned—often with a stinging indictment of the parochialism, imperialism, and paternalism of the North Atlantic West—and changed America. Emeritus professor of history at U.C. Berkeley, Hollinger compellingly shows why the history of missionaries is worth understanding. Over his years of scholarship, he connected dot after dot that linked missionary-connected individuals with key transformations in America. Now that he’s told their story, it seems astounding that it’s been overlooked for so long. The account begins at the turn of the 20th century when optimistic American Protestants pursued “the evangelization of the world in this generation,” and it ends with post-Protestant secularism around the time of the Vietnam War. Missionaries weren’t the only Americans who lived abroad in the 20th century. But unlike expat families of businessmen or diplomats who typically sent their children to English-speaking schools and restricted their social circles to Westerners who looked and sounded like them, American missionaries deliberately lived in close relationship with people groups unlike them. This intimate contact with foreign peoples, especially in Asia and the Middle East, challenged many of their inherited prejudices toward non-Westerners, the rightness of American ways, and even how they understood the Christian mission itself. When their families returned to the homeland, they brought their transformed perspectives and specialized knowledge of foreign cultures to American politics, universities, secret service agencies, churches, civil activism, media, and more. Princeton University Press (2017). 408 pp. $35.00. Hollinger differentiates between two branches of the church whose missionary projects took different courses: mainline and evangelical. While mainline-supported missions waned considerably by the 1950s and 1960s, evangelicals have maintained an active missionary project up to the present. The mainline missionaries, however, had a far deeper influence on American public life, and thus they receive greater attention in this book. Mainline/liberal Protestants enjoyed a cultural clout in the early- to mid-20th century that was generally denied to evangelicals (with the exception of Billy Graham). Seeking to accommodate Christianity to modern times, they tended to embrace higher criticism of the Bible, an ecumenism bent on advancing universal humanitarianism (as institutionalized in the Federal Council of Churches), and social gospel theology (which rooted sin in social problems, and salvation in social solutions). Alongside their revisions of traditional Christian stances—and perhaps owing in part to them—their missionaries more readily inclined to what Hollinger calls “missionary cosmopolitanism.” They were “proto-multiculturalists and proto-world-citizens” (23). In other words, living overseas complicated their identities as Americans. They experienced multiple cultures and identities, and thus never felt fully at home in America or abroad. Consequently, many adopted a more cosmopolitan worldview and sense of self that allowed them to transcend nationalist parochialism and blindness. For many, this cosmopolitan turn entailed a radical rethinking and de-Westernization of Christian missions. As reflected in the 1932 “Hocking Report,” or Re-Thinking Missions: A Laymen’s Inquiry After One Hundred Years, liberal Protestants reconceived the Christian mission as ultimately a philanthropic enterprise—not preaching and conversion. They viewed foreign peoples not as heathen to be rescued but as equal collaborators in global humanitarian causes, and they adapted their missionary project accordingly. As Hollinger rightly argues, against popular assumptions, this challenge to traditional conceptions of Christian missions was a far more divisive matter in the Modernist-Fundamentalist controversies of the 1920s and 1930s than debates over Darwinian evolution. The generation that guided the turn still rooted their philanthropic agenda in Christian ideals, but later generations found religion superfluous. By the 1960s and 1970s, the mainline missionary project was eclipsed by post-Protestant secularism. Nonetheless, its legacy in American public life was enormous. American Missionaries Changed . . . America? Hollinger’s cast of missionary cosmopolitans who rode the boomerang consists of fascinating women and men. Chapter 2 charts the paths of Henry Luce, founder of Time, and writers Pearl Buck and John Hersey. All three were born to missionary parents in China around the turn of the 20th century, and each reacted in different ways to their parents’ missionary impulse to save the world—or “the imperialism of the spirit,” as Buck put it. While Luce substituted the Christian mission with America itself as the answer to the world’s problems (as seen in his 1941 Life article “The American Century”), Buck and Hersey pointed to the myriad hypocrisies and injustices of America and its own need for salvation. Buck promoted the equal rights of non-whites and women, advocated independence for countries under Western imperial rule, campaigned against racist policies like the Chinese Exclusion Act and Japanese detainment camps, and lobbied for transracial adoptions. In her most famous novel, The Good Earth (1932), she challenged American readers to forfeit their orientalist biases and see the equal humanity and dignity of the Chinese. Hersey, first as a journalist covering World War II and then as a novelist, dealt a swift blow to the moral superiority complex of America. Similar to The Good Earth but in a different form, Hersey’s journalistic book Hiroshima (1946) made Americans reckon with the humanity of the Japanese victims who suffered the devastation of the atomic bombs. Moreover, through the characters of his Pulitzer Prize-winning novel, A Bell for Adano (1944), he showed Americans a darker side of their soldiers and generals than what they were being sold in popular film and media. Individuals like Buck and Hersey forcefully raised the question: Is America the world’s savior? 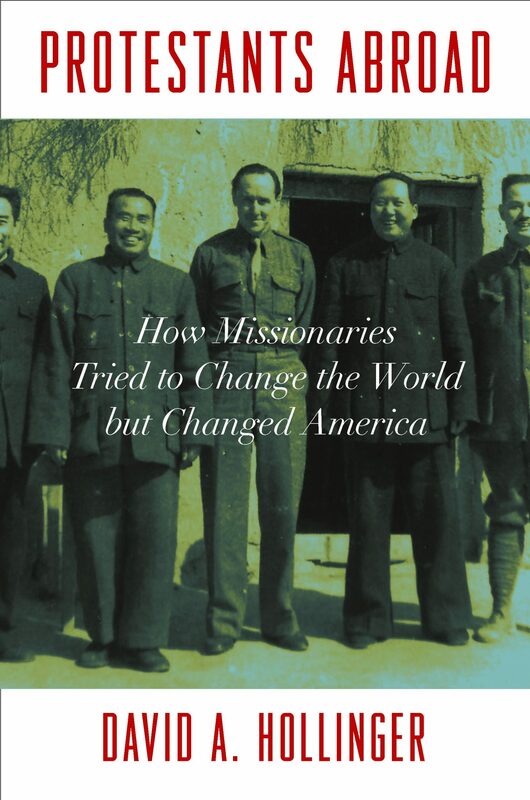 The other chapters detail the many ways missionary-connected individuals influenced American public life. Figures like William Eddy—who was born in Lebanon in 1896 to missionary parents and later served in the State Department, Foreign Service, and OSS (later CIA)—used their knowledge of the Middle East to influence U.S. government policies in favor of the Arab world (though they largely failed). Kenneth Landon—whose declining faith and frustrations with his denomination caused him and his wife, Margaret (author of bestselling missionary novel Anna and the King of Siam), to leave Thailand as missionaries—returned to become the leading scholarly authority on Thailand and advised the U.S. government on critical matters related to the region. Missionary-connected women and men challenged orientalist prejudices in American academia, media, and government, contributed to the civil-rights movement, campaigned against the Vietnam War, and so much more. Cosmopolitanism Incompatible with Evangelical Missions? Hollinger tells a fascinating and illuminating history, and I commend it highly. However, readers like me who are sympathetic with the core of the evangelical missionary project may wonder if Hollinger adequately grants evangelicals the same complexity he so readily attributes to liberals. His criteria for what constitutes “cosmopolitan” seems to narrowly exclude anyone who maintained the centrality of evangelism and the authority of Scripture in missions. But are they so antithetical? Regardless, for those willing to learn from history, the book is full of challenges. We can learn from these characters about what to do and what not to do. In a time when nationalism is on the rise, many evangelicals are more invested in making America great again than bearing witness and building bridges for a global and trans-ethnic church. Unlike the men and women in this book, however, we need not—and indeed must not—sacrifice our most powerful hope for cross-cultural reconciliation and peace: the gospel of Jesus Christ.